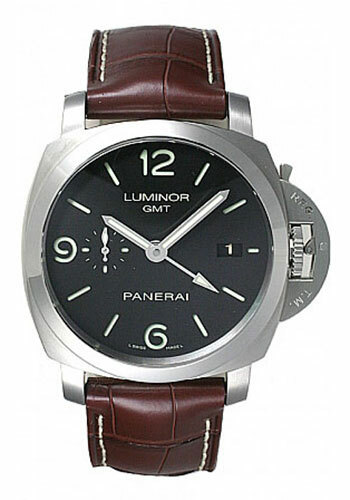 44mm AISI 316L brushed steel case, see-through sapphire crystal back, polished bezel, brushed steel device protecting the crown, black dial with luminous Arabic numerals and hour markers, date at 3 o’clock, seconds at 9 o’clock, automatic Panerai P.9001 calibre movement with hours, minutes, small seconds, date, second time zone, power reserve indicator on the back, seconds reset, approximately 3 days of power reserve, brown alligator strap. Water resistant to 300 meters. 44mm AISI 316L brushed steel case, see-through sapphire crystal back, polished bezel, brushed steel device protecting the crown, black dial with luminous Arabic numerals and hour markers, date at 3 o’clock, seconds at 9 o’clock, automatic Panerai P.9001 calibre movement with hours, minutes, small seconds, date, second time zone, power reserve indicator on the back, seconds reset, approximately 3 days of power reserve brushed stainless steel bracelet. Water resistant to 300 meters. 42 mm stainless steel case, black dial, P.9001 calibre automatic movement with hours, minutes, small seconds, date, GMT, power reserve indicator on the back, seconds reset, approximately 3 days of power reserve, black leather strap. Water resistant to 100 meters.